Building a garage gives you some space to do some work you can't do inside a house and a place to store your vehicle. But a garage should ideally be properly ventilated and should have a large space to carry on your activities. Browse through these carport and garage plans to help you in building your own all-purpose garage or a carport in an affordable way. Here is a detailed guide for building a garage. Plans to build a 10 x 20ft free standing carport. An attached carport is fairly easy to construct against the side of another building. 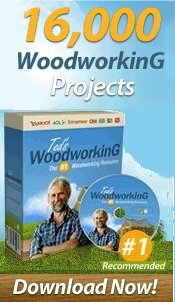 Here are downloadable plans for a standard two car garage. Garage Download plans for a detached single car garage with rear windows and a side door. This single car garage has extended room for storage or a small shop with access door. Build an attractive two car garage that has an upstairs loft, door and window. This 24 x 20 ft. one car garage has a 7 ft. ceiling, 2 x 4 construction and slab foundation. Free plans are nice, but if you want to buy a garage plan instead, check out the variety listed below. 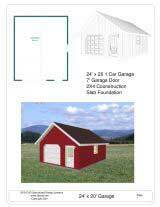 Individual garage plans are available as well as books. 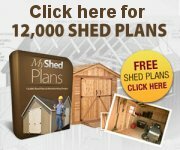 Nice plans for building garages,barns, workshops, greenhouses and many other attractive workplaces.